Where Jeanneau owners can talk about adventures, our boats and discuss boat projects. Jeanneau Sun Charm 39 (1989 ) opinions anyone? 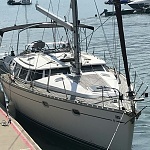 Late 80s early 90s Jeanneau Voyage 12.5 Info?